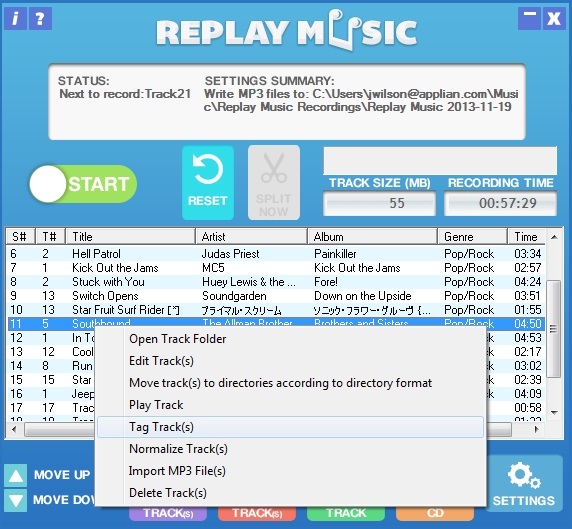 Replay Music is a revolutionary new way to capture streaming music from the Internet or any external source and save them to your hard drive or CD's. And it's really easy to use, too. Replay Music 6 will start recording the audio you hear. It's that simple. Replay Music is now Windows 8 Compatible, and includes better accessibility for blind users. Additionally, new audio recording formats have been added (M4A, OGG, FLAC, and WMA) for greater flexibility with music players. IMPORTANT: When recording, be sure to open Replay Music first, THEN open the music player program or browser you're using. If recording from a website, be sure to see number 14 below. Open Replay Music by clicking the Replay Music icon on your desktop. In Replay Music , click the Start Recording button. The Start Recording Session dialog appears. Optionally, enter a name for the Artist and Album. This is used if Replay Music can't determine the artist or album name. 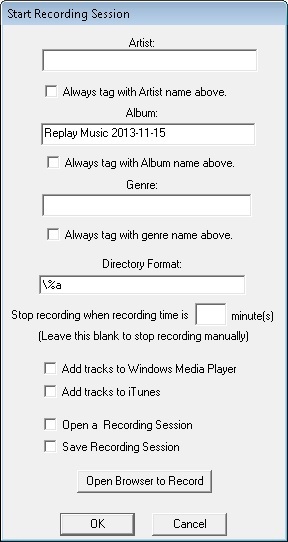 If you select the "Always tag with Artist/Album name above" option, Replay Music will use whatever you have entered above as the Artist and Album for that entire recording session. This overrides Replay Music's Album/Artist lookup. Enter a Default Genre. If Replay Music cannot determine a genre, then this one is used. Check Always tag with Genre name above if you want to override Replay Music's genre lookup. You can customize how files are saved into subfolders using the Directory Format. You can also combine tags -- for example, %A\%a will create an artist directory with the artist's albums as a subdirectory. Save Recording Session:Selecting this option will prompt you to save your recording session to a file so that you can open it again later to edit track information or to continue recording. To ensure Replay Music is recording, look for the VU Meter graph moving rapidly on the main screen. This lets you know that Replay Music can "hear" the audio to record. If you do not see movement in the VU Meter, then Replay Music is not detecting any audio. Make sure that you always open Replay Music PRIOR to starting the application that you will be recording from. After each song ends, Replay Music determines the artist and track name, and displays those names in the recorded songs list. After you're done recording, click the Stop Recording button. This ends the recording session. If you've specified that a CD is to be created, or if you want to add songs into iTunes, then those operations will occur at this time. Occasionally a track will tag a track as unrecognized. However, you can give Replay Music another chance to tag unrecognized tracks. You can edit information that is saved along with each recorded song. This allows you greater control over how songs are labeled, or allows you to properly tag a song that is unrecognized by Replay Music. You can edit tracks one at a time, or several at once. Click Edit Track(s). Or right-click on the track to edit and select "edit track" from the menu options. Click Lookup Art to check the music database for album art. If none is found you can choose Load Art to attach your own. Click OK and the song data is now changed in the music file. Change the Artist, Album or Genre tag. If you don't want to change a tag, leave it blank. To move tracks: Right click on the track to move and select "Move Track(s) to directories according to directory format". This allows you to move already recorded songs in the track list to the same folder selected in the "Directory Format" text box found in the "Start Recording Session" dialog box. This is good for organizing songs. Click Genre to sort by genre. After recording, you can delete tracks you do not wish to save. You can delete tracks using the "delete" button, or by right-clicking on the track and select "delete" from the menu options. Select "delete" from the menu options. Replay Music lets you configure some parameters for optimizing the recording experience. Start by clicking the Settings button, and the Settings dialog appears. Pick a folder to hold recorded files: This is the folder where your recordings are saved. Actually, they are saved in a subfolder under this folder, with the same name as the album name. So, if this setting is "D:\Music", and the album you're recording is named "Eagles", then songs are saved in "D:\Music\Eagles". Input Source: For most streaming recordings, use Windows Audio Driver as the input source. Windows XP users should select the Audio Driver option. Audio Driver will record from the source, leaving out system sounds. It is recommended that you turn off Windows system sounds. 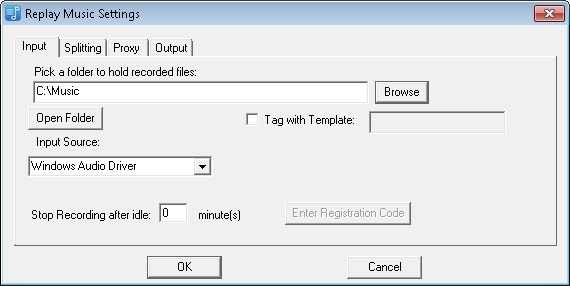 Tag with Template: Replay Music does a great job of automatically tagging tracks for you, but sometimes you may want to take the tag data directly from the browser. Some online music sites will list the track information in the browser's title bar for each individual track that is currently playing. If you'd like Replay Music to get its track information directly from the browser's title area, enable this setting along with the format that the site uses. For example, Last.fm prints the artist and song title information in the browser title area like this %A-%T-Last.fm. As always, %A=Artist, %T=Title of song, %a=Album. This will work with any website that lists the track tag information in the browser title bar. Stop Recording After Idle: If you're doing an unattended recording session, you can have Replay Music automatically stop recording once a certain amount of idle time is detected. Set this to zero to disable this feature. Enter Registration Code: If you haven't already done so, you can register your copy of Replay Music with this button. 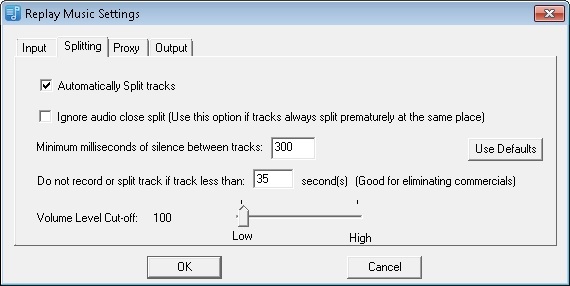 Automatically Split Tracks: Enables automatic track splitting. If you uncheck this, then no track splits take place while recording. Do not record or split track if less than __ second(s): Occasionally when recording, you may get partial tracks or unwanted interludes. This setting lets you choose to eliminate tracks under a certain length you decide. Volume Level Cut-off: When Replay Music determines silence, it uses a minimum volume threshold for deciding what "silence" is. For example, if you're recording from a vinyl LP, there may be some detectable background noise. You can increase this value if recordings are not being split properly, if you think that some background noise is occurring. If you want to capture more, near silent content, decrease this. Volume Level Cutoff: 500 - 900 range. 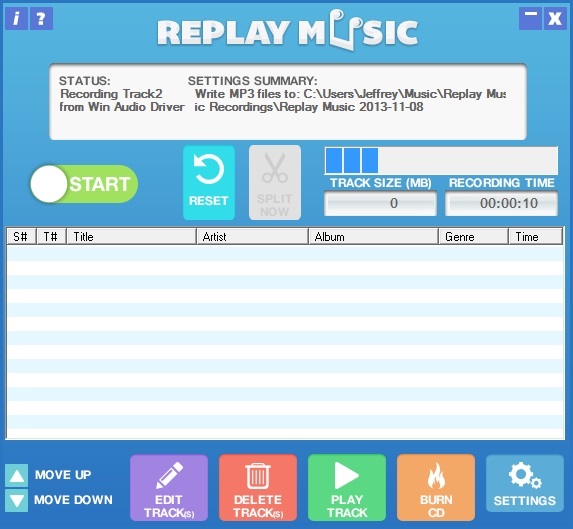 Replay Music needs to access the Web to determine the artist and track title for each song. If you connect to the Web using a proxy server (most connections DON'T), then set the Proxy Address and Port here. Replay Music can save music files to your hard drive or automatically burn CDs for you. The default is %T-%A which means the track name will come first, then "-", then the artist name. Track & Sequence number File name digits: Setting this option to "2" will add leading zeros to track number in the file name for better file sorting. FLAC: The Free Lossless Audio Codec is a compressed audio format that attempts to make a "lossless" reproduction of the recording. M4A: A compressed audio format popular among Apple products. MP3: Makes individual MP3 files from each song. 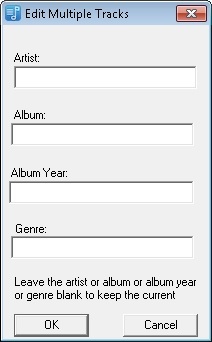 WMA: Makes individual WMA files from each song. WMA is common on Windows computers. Ogg:Another free, open audio format. For M4A, MP3, Ogg, and WMA, you can choose a different bitrate from that being received by your computer. Note that saving to a bit rate higher than the original recording has no effect on the quality. Normally, 128 Kbps or 196 Kbps is sufficient for excellent quality. Record to WAV: Makes individual, uncompressed WAV files from each song. When reach 700 Mb Max: This ends the recording session, and burns the MP3 DATA CD once the total size of recordings becomes 700 Mb, the maximum capacity of an MP3 DATA CD. When reach 80 minute max: When burning audio CDs, the CD creation process will start once 80 minutes of songs have been recorded. Kbps: Select the bit rate of the final file. Generally 128 Kbps gives great quality, but you can go up to 320 Kbps. Note that recording a 128 Kbps stream and outputting it to 320 Kbps won't give you any better sound quality. CBR or VBR: CBR stands for Constant bitrate and VBR stands for Variable Bitrate. CBR is the older encoding method, so all MP3 players recognize this encoding method and a player can easily calculate the length of the MP3 recorded with this method. VBR is a newer encoding method so the recorded files will usually be smaller compared to CBR, but some players do not recognize this method and may have a hard time measuring the length of the recording. 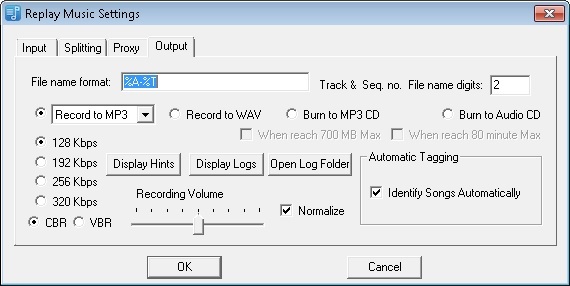 Normalize: Select this option to obtain consistent volume in your recordings. You can also import files from your music library into Replay Music and normalize them as well. Replay Music can burn CDs automatically from your recordings. Both Audio CDs and MP3 DATA CDs can be created. Plus, you can make CDs on-the-fly, or pick tracks to place on a CD after a recording session has ended. In Replay Music's Settings, change the Input Source to Line-In or Microphone (depending upon which port you connected to in step 1). Click OK when finished. Turn off Rhapsody's equalizer. Click on Tools, Equalizer and set it to the OFF state. Keep Rhapsody's main volume level to at least mid-range. As with all player programs, be sure to open Replay Music PRIOR to opening Rhapsody. Please note: Replay AV and the Freecorder Toolbar use the same specialized audio driver that Replay Music uses. Please make sure that these programs are closed when using Replay Music. On the left, choose Allow an app or feature through the Windows Firewall. Click Allow another App...Then choose Replay Music from the list provided. Click OK. Replay Music will now be able to access the Web to lookup song information. Tab = Moves forward through interface elements. Shift + Tab = Moves backward through interface elements. Ctrl + Tab = Moves forward through the tabs in settings. Ctrl + Shift + Tab = Moves backward through the tabs in settings. Song recognition uses technology licensed from Rovi Corporation and AMG. The license agreement is here.